There is an urban myth borne of two areas of modern mythology: cinema and Liverpool. When Elia Kazan was filming On The Waterfront, in 1953 in a dockside bar in New York, two Liverpool merchant seamen were allowed to stay during the filming. Apparently you can see the backs of their heads in a mirror. During the Depression years, Kazan had been a member of the US Communist Party and this was to be used against him when he was summoned to appear before a House Committee on Un-American Activities hearing in April 1952. Initially Kazan refused to name those who were fellow-members but he was eventually pressurised into naming names. The fact that the committee already had those names on their list did nothing to ease the disapprobation brought down on him by his past colleagues and it is in this atmosphere - during the filming of one of Kazan’s most famous, and greatest movies, On The Waterfront, based on a script originally written by Miller, called The Hook - that the action of Waiting For Brando takes place. Kazan was at the height of his career, having moved from the New York Group Theatre where he had earned a reputation as a great stage director and befriended the playwright Arthur Miller. In 1947, he founded the Actors Studio, promoting the rising stars of the Method Acting school such as Marlon Brando, James Dean, Montgomery Clift, Julie Harris and Eli Wallach. As a director he made Gentleman's Agreement, a powerful indictment of anti-Semitism in the USA. His films were noted for their realism in tackling social issues. In the post-war period, the world was carved up between Soviet and US spheres of interest. In the period following the Russian Revolution, the US government launched a fierce attack on working class militancy (for an excellent account of this period see 100 Years of Labor in the USA by Daniel Guérin) and checked the growth of the Communist Party. However the campaign deployed after World War Two, whilst having the appearance of an assault on Communist ‘fellow-travellers’, especially amongst the US intelligentsia, ushered in an enduring period of non-partisanship between the Democrats and the Republican parties, particularly around foreign policy, as the US came to realise the importance of the Munroe Doctrine in the 1920s, and its role as World policeman. Nowhere was the relationship between the intelligentsia and the masses more apparent than in the film industry. During the war, Democrat president, Franklin D. Roosevelt, gave his blessing to the filming of Mission T Moscow along with other pro-Soviet films of the time. Neither was a commercial or critical success, yet it would be these films that would serve as the basis for an investigation in communist infiltration of Hollywood, as the USSR, erstwhile wartime ally, became the principal competitor for global influence. After early, less formal, committees dealing with ‘subversive’ infiltrations came and went in the years after the Russian Revolution, the House Committee on Un-American Activities became a standing committee in 1945. 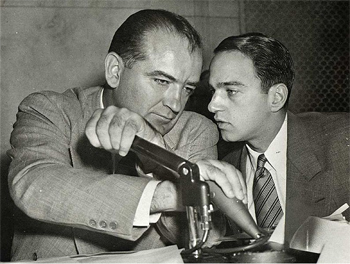 These years became known as the period of McCarthyism, named after the Republican Senator Joseph McCarthy, a degenerate thug and alcoholic, who would rise to greater prominence in 1950 when he ‘produced’ a list that he claimed to be the names of ‘known Communists’ working in the State Department. But it was his dealing with Hollywood that made him an infamous public figure. Hundreds were imprisoned and thousands lost their jobs and were blacklisted by the film industry. The times tested loyalties, not just to a cause but to personal ties that seemed so strong hitherto. Employees of all level were called to hearings. Some, like Larry Parks, an actor on the crest of stardom, felt they could rely on the understanding of the inquisitors, but were cut down. Others took the first amendment and others named names. Elia Kazan was one of the latter. Waiting for Brando opens in an empty bar, where Eddie Walsh (Daniel Hayes), sits waiting for someone to serve him a drink. A jukebox plays hit records of the time: Mona Lisa, Stranger In Paradise, to name a few. To the left of the stage is a writing desk on which Kazan (played outstandingly by Paul Duckworth) is typing. He pulls the paper from the typewriter and throws it in the wastepaper basket. Behind him stands Arthur Miller (Carl Cockram, also the director of the play). We then hear a radio jock go through issues of the day and mention Kazan’s appearance in front of the committee. He then plays Hank Williams’ Your Cheatin’ Heart. Eddie is reading a letter from his girlfriend back in Liverpool. Minutes later someone comes into the bar and, walking straight up to the counter, leans over and helps themselves to a drink. Initially we are led to believe that the man is a stranger to Eddie, but after a bit of banter and tomfoolery, we discover that the stranger is Vinnie (Joe Shipman), Eddie’s younger brother. They talk about the exciting music that is to be found in the US, reminding us that it was men who worked on the ships who were responsible for the pop music trends, such as the Merseybeat. As the stage light moves from Vinnie and Eddie we see Elia Kazan at his desk with Arthur Miller standing behind him, teasing him, telling him that he can never make another great movie: no-one in the industry wants to work with him. A film set crew enters from the right. One member tells Vinnie and Eddie that they can stay in the bar whilst they film a scene with Brando. Vinnie is excited about this whilst his brother is less so. This points to one of the major themes of the play. For whilst Eddie is the elder and has responsibilities to his family back in Liverpool, it is easy to find ourselves relating to Vinnie’s enthusiasm for his new experiences in the US, whereas at one time we might have dismissed it as youthful idealism. There is an aspect of the dialogue between Eddie and Vinnie that jars a bit and that is the manner in which Eddie tries to temper his brother’s enthusiasm by reminding him of the racism that is endemic at the time in the States. This felt contrived, and it also lacked authenticity - as a seaman, Eddie would have been exposed to such progressive ideas, particularly when we consider the attitude to the Chinese community in Liverpool, especially the racism exhibited on the docks and aboard ships after the Chinese merchant seamen strike in 1938 (e.g. see Chinese-Liverpudlians by Maria Lin Wong for an indication of the attitude towards Liverpool’s Chinese community, rather than an exposé). Morris and Higginson make use of the two duos so well as the story weaves through to the taunting of Eddie and Kazan, and the gulf that separates each couple. But this is not comparing like with like. Throughout, Kazan is haunted by the presence of Miller; it suggests that Miller is the conscience rather than a physical part of Kazan at this moment. Both Eddie and Vinnie are certain of their situation, both have plans for their future. It is hard not to empathise with Eddie’s recognition of the fact that he needs to grow up and take responsibilities and when Vinnie reads the letter from Eddie’s girlfriend, that raises doubts about his older brother. But the real ‘sell out’ comes when Eddie owns up to taking on a union job. It is at this point that the major theme of the play hits home. Both Miller and Eddy are as much haunted by their past and Kazan and Vinnie see a betrayal in that past: the Moscow show trials having illustrated the degeneracy of the Communist Party whilst it is suggested that the old unions have nothing to offer up for the future except repeatedly broken promises. Miller and Eddie see the Communist Party and the Union the only way forward and yet it is the irony that only Vinnie is concerned with the future, and though Eddie tries to convince Vinnie of working class principles they obviously mean nothing to the youngster. But a greater question is: do those old institutions mean anything to us, in our world today? Waiting for Brando doesn’t provide us with any answers. In the forward to the programme Kevin Nelson, Regional Secretary of UNISON (North West) finds comparisons with today in the paranoid USA of the late 1940s and 1950s. He informs us that today we are fighting for the importance of trade unions. This was not how I saw it. The play seemed to concern itself with the role of the individual consciousness within organisations. For Vinnie the future that is offered by what he sees and hears in New York is more attractive and exciting than that offered by his dead-end family and working life back in Liverpool, with all the demands that would make on him. Whereas Eddie cannot break with what he sees as his duty. Likewise we are offered a picture of Kazan that is not just the straightforward bad guy nark. The film he is working on, that is the backdrop to this play, may well be redemptive, but one could not escape the question ‘Did he identify with Terry Malloy (the Brando role in On The waterfront)?’. So should we not sympathise with the plight of Kazan? For me the character least sympathetic was that of Miller (subtly played to great effect by Carl Cockram). After all here was a man who was prepared to dismiss the Moscow show trials as an unfortunate incident rather than as a central step in building and maintaining a totalitarian regime that detached itself from the Russian people. Waiting For Brando is one of the most exciting new plays that I have seen in recent years. Mike Morris and Steve Higginson are following in the footsteps of Alan Bleasdale et al, part of a powerful tradition of writing for the stage that is central to the city’s history. The writers, actors and the director of this masterpiece, do not force any one idea, and the audience is left to consider what the play says about the world we live in as well as our role in that world. Waiting For Brando played at the Unity Theatre for three nights as part of the Writing on the Wall Festival. Justifiably it was a sell-out and we can entertain a hope that there will be funding for productions such as this in the future.